Glory Vertera 6G Cash Recycler - Technology Unlimited, Inc.Technology Unlimited, Inc. 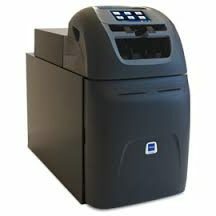 The Vertera series builds directly on the reputation of the leading cash recycling system – the pioneering and highly acclaimed TCR Twin Safe®. The Vertera, however, offers significantly enhanced banknote authentication, increased performance and the ability to drive down operational cost – all in a compact device that is easily incorporated into the branch. The Vertera delivers real business benefit at multiple levels and provides a comprehensive and integrated solution to address the demands of the customer, the teller and improvements in branch efficiency. Provides a fast, efficient service for customers with fewer queues and a more personalized service that only a fully supported and attentive teller can provide. + Reduces monotonous and repetitive tasks as the Vertera provides a highly efficient and secure cash recycling solution.Advanced authentication and fitness sorting capabilities, ensuring a robust first line of defense for the bank branch. + Authenticity detectors are configured by Glory to the specific currencies required and are configurable to customers requirements. + Optimizes branch business processes with deployment flexibility designed into the solution, virtually eliminating start-of-day and end-of-day set up activities, and providing a consolidated view of the branch cash holding. + Compact design that provides the flexibility to fit seamlessly into the working environment, whether tellers are standing, sitting or mixed mode. + Sixth generation recycling technology providing trusted reliability and performance.